Add the tomatoes to a food processor and chop until it reaches your desired consistency. Pour into a bowl and set aside. Next, add the onion, cilantro, habanero, garlic and lime juice to your food processor. Blend to desired consistency and pour this into the bowl with the tomatoes. Add the spices to the bowl and combine well. 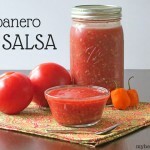 Transfer the salsa mixture into two 1-quart mason jars and close the lid tightly. If fermenting, leave this salsa on the counter for 2-3 days, then transfer the jar to the fridge where it will last for a few months. If not fermenting, eat this salsa within a week. If you do not have a food processor, you can use your blender or chop by hand. If chopping by hand, make sure your salsa has enough liquid to cover the vegetables if you decide to ferment.